POWER OF PRAYER: Aldean Pablo, assistant pastor at Eastview Wesleyan Church, takes a turn leading a prayer during the National Day of Prayer event at the Marion Municipal Building on Thursday. Almost 60 people bowed their heads in prayer at Marion City Hall Thursday afternoon. Coinciding with the annual National Day of Prayer, city and county government workers, council members, sheriff’s officers and local residents convened in the lobby of the city building to pray for the well-being of Marion, Grant County and more. Marion Mayor Jess Alumbaugh said he was pleased with the turnout and the diversity of people that attended, including the eight local religious leaders that prayed aloud. “I was pleased to see so many people that understand and value the power of prayer,” Alumbaugh said. A joint resolution by Congress, signed by then-President of the United States Harry S. Truman, established a National Day of Prayer every year, according to the National Day of Prayer Task Force. An amendment to the law in 1988 permanently set the day for every first Thursday in May. Originally scheduled to take place outside the city building, the local commemoration took place indoors due to weather conditions. The harsh rain and winds, however, did little to deter people from participating. Jeffrey Jahn, pastor of Westminster Presbyterian Church and chaplain for the Marion Fire Department, began by giving a prayer of thanksgiving and repentance. He prayed for the heroin epidemic in Grant County and asked God to teach families to come together in support of one another. Every pastor was assigned a specific topic to pray about. Following Jahn, Pastor Al Green of Calvary Missionary Baptist Church prayed for local, state and federal government; Dawn Jones of Alabaster Box Ministries prayed for military and veterans; Marion Police Department Chaplain Mark Bardsley prayed for media and news reporters; and Aldean Pablo, assistant pastor of Eastview Wesleyan Church, prayed for local businesses. Jim Lo, campus pastor intercessor at Indiana Wesleyan University, followed Pablo with a prayer for education. Grant County Sheriff Department Tom South prayed for local churches, and Pastor Colleen Harden of the First United Methodist Church ended with a prayer for families. “The best weapon we have for change is prayer,” Alumbaugh said. Marion city officials still pray every Monday morning, or the first working day of the week if Monday is a holiday, at 7:30 a.m., he said, in the Marion city council chambers. GAS CITY — Eastview Wesleyan Church is in need of volunteers to help load trucks with relief items on Saturday to send to Houston and other areas impacted by hurricane Harvey. The church is donating items from their resource building. Eastview Wesleyan Church is a designated spot for the Red Cross if a disaster were to strike in the area, pastor Mark Atkinson said. Items, which include hygiene and paper products, have been accumulating for a couple years. Loading will begin at 9 a.m. on Saturday at the church, located at 414 N. 10th St. in Gas City. 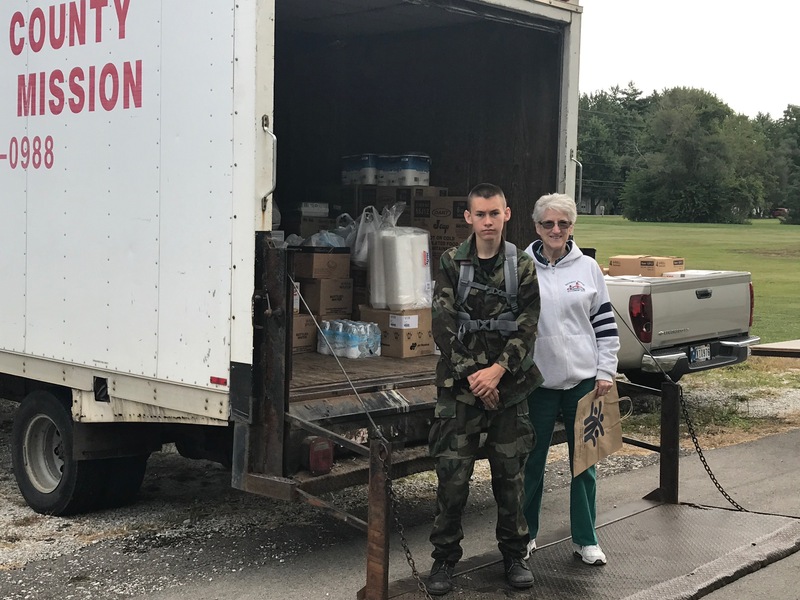 Supplies will be taken to the Summitville Fire Department who will deliver them to the disaster-stricken areas. Anyone who has a truck and can help transport items to Summitville is encouraged to contribute their time. Susan Losure, nursery coordinator at the church came up with the idea to donate their items. The church will accept personal hygiene items from the community during the loading process on Saturday. Randy Sizelove, Summitville fire chief, said they have three semi-trailers that will be used to transport items to Texas and Louisiana. The fire chief said they have received quite a bit of support with supplies coming from all over the state including Indianapolis and Lake County. “Things kind of took off with multiple people jumping on board,” he said. Sizelove, who also works for FEMA, will travel to the flooded areas along with members of the fire department. They will travel to Cameron, Louisiana before dispersing to communities needing help. Members of the fire department will volunteer their time.